Holiday.gr - Afissos, a trip to a myth! 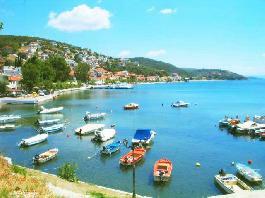 The beautiful holiday center of Afissos is 26 km from Volos. The village is built amphitheatrically and is surrounded by olive groves that reach the top of the slope. Once you see the image of the settlement, it has the feeling that it is on an island, as the houses overlook the sea. The beach of Afissos is divided into three wonderful coasts, Kallifteris, Lagoudi and Ambouvos, which is the largest of the settlement. The green here also touches the wave creating amazing landscapes. In the square of Afissos the water springs from the source that drank water at the time of delivery, the Argonauts shortly before embarking on their journey to distant Kolchida. Green, flowered with calm waters and intense tourist traffic in the summer, Afissos offers a quiet holiday. Been to Afissos ? Share your experiences!